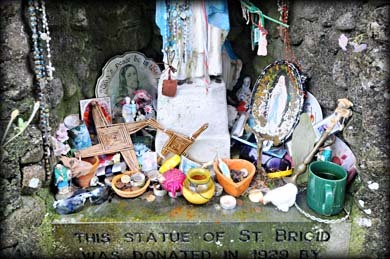 Located about 500 metres west of the mythological centre of Ireland, the Hill of Uisneach, is this ancient well now dedicated to St Brigid. 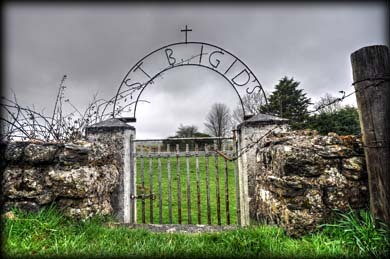 A wrought iron gate by the side of the R390 leads to the well which is situated in a small enclosure about 50 metres north of the road. There is a large tear-drop shaped pool with an outlet at the narrow end and a shrine standing at the widest part. Being so close to the sacred hill I would imagine this site was a place of worship long before Christianity came to Ireland. To the east of the pool is the scant remains of a church. Also present is the customary rag tree. A wonderful serene location well worth a visit. The well is hidden from view in this small enclosure about 50 metres from the road. 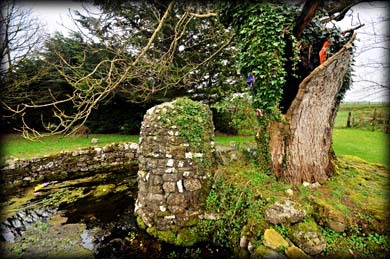 Situated: From Mullingar head southwest on the R 390 for about 18 Kilometres. 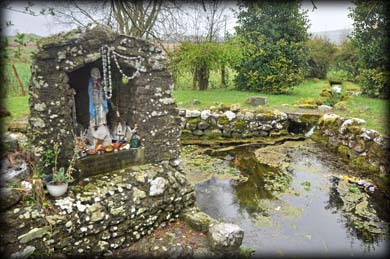 The well is situated on the northside of the road about 200 metres passed the Uisneach Inn. It's best to park at the Inn and walk up to the well. Discovery Map 48: N 2769 4840. Last visit April 2014.